I first met Pham Huy Thong in Hanoi three years ago when I was working on a story on the Vietnamese art scene for Readers Digest. 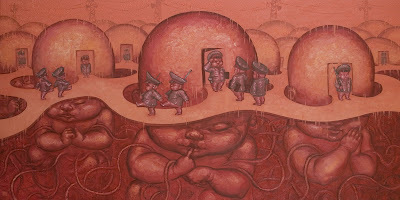 The young Vietnamese artist was teaching art at a local university and moonlighting as a translator and took me around to see some of the top artists in Hanoi. Since then he’s taken up painting full-time and the gamble is paying off. This is some of the most interesting (read politically and socially engaged) work I’ve seen coming out of Hanoi for a while. He’s also getting noticed internationally, a Singapore gallery is about to take him to the Shanghai art fair. Over the last two years of so, he’s been working on a series based on an old Vietnamese legend about how the Vietnamese descend from Lac Long Quan (a dragon from the ocean) and Au Co (a fairy from the mountains). Au Co gave birth to 100 sons and since then Vietnamese have called each other “Dong bao”, which means children from the same womb. Despite this meaningful creation tale, Vietnamese have a long history of killing and persecuting each other and even today discord and discontent between different groups of people is evident throughout society, the artist says. 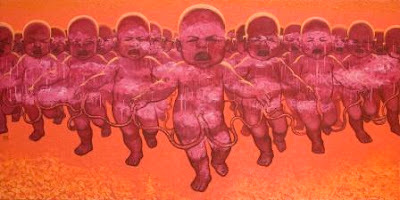 In most of his paintings, he’s been using crimson background as if the scene are still taking place in Au Co’s womb, and Vietnamese are symbolized as babies linked each others by an umbilical cord. In some works, Pham reenacts historic Vietnamese moments, immortalized in photographs, like the evacuation from Saigon on the last day of the war or the “Napalm girl.” I find these latest works very strong and meaninfull. I know some collectors are already trekking to his studio. If he continues in this direction, he's going to be hot!